From 1999 to 2001 inclusive I taught the 2nd-year Dynamics course. In 2002 I will be supported by a Research Fellowship and will stop teaching this course. I will hold a clinic on Tuesdays and Saturdays after lectures in the Old Bursary, Darwin College. Anyone is welcome to come along and give feedback or ask questions. Physics teaching by the Inference group is supported by the Gatsby charitable foundation. Here is the official course synopsis, from the Physics Course Handbook. Accompanying pages give more details on the lecture sequence and emphases of the course. The energy method: Equations of motion from energy functions. Central force problems re-expressed as one-dimensional problems. Perturbations of circular orbits. Lagrangian and Hamiltonian dynamics. State-space diagrams. Conservation of angular momentum, energy, phase space volume. Perturbation methods and the simple pendulum. Dimensional analysis. Normal modes: Counting degrees of freedom. Square matrices as linear operators and in quadratic forms. Eigenvectors. Stability analysis using normal modes. Use of symmetries to find normal modes. Beats. Modes of molecules. Elasticity: Definitions of strain and stress as tensors. Young's modulus, Poisson ratio, Shear and bulk modulus. Relationship between shear, compression, and extension. Central forces: Kepler's laws. Planetary orbits. Scattering. Predicting cross sections using dimensional analysis. Orbital transfers. Gravitational slingshot. Rotating frames and fictitious forces: Centrifugal and Coriolis forces. Rigid bodies: Relationship between angular velocity vector and angular momentum vector. Collisions of rigid bodies. Precession of the earth. Analytical Mechanics, Hand, L.N. and Finch, J.D. (Cambridge 1998). - it will take you up to the level of part II Theoretical Physics and beyond. Costs less than 30 pounds, and is on discount at amazon. Kibble and Berkshire (1985, 1996). Classical Mechanics. Addison Wesley Longman. - This is at the same level as the 1B course, and is good in parts. Lectures on Physics, Feynman R P et al. (Addison-Wesley 1963) Vol 2: Two useful chapters. Theory of Elasticity, Landau L D & Lifshitz E M (3rd edn Butterworth-Heinemann 1995). Mathematical Methods for Physics and Engineering, Riley RF, Hobson MP and Bence SJ (CUP 1997). This is the draft lecture sequence from 1999. The actual sequence used in 1999 and 2000 can be seen by looking at the lecture notes. There are several changes. Lagrangian and Hamiltonian dynamics (introduced without using calculus of variations). Examples of the energy method. Compound pendulum. Rolling hoop with mass on the perimeter. Slipping ladders. Moment of inertia. Conservation of angular momentum. Other conserved quantities: energy, phase space volume. Use perturbation methods to estimate error of pendulum clock. Show Huygen's method for making isochronous pendulum and relate to dynamics of the rolling hoop. Modes of molecules. Stability analysis using normal modes. Square matrices as linear operators and in quadratic forms. Eigenvectors. Transformation of linear operators and of quadratic forms. Perturbation theory: coupling of normal modes. Weak coupling of nonlinear oscillators. Taking the continuum limit of systems of masses and springs, we come to the wave equation and elasticity. Definitions of strain and stress as tensors. Young's modulus, Poisson ratio, Shear and bulk modulus. Perturbation of wave equation on a wire by the stiffness of the wire, for example, harmonics of piano strings. Microscopic view of elastic behaviour. Rebound of elastic ball or rod from hard surface. Kepler's laws. Planetary orbits. Perturbations of circular orbits. Scattering. Contrast between cross sections of hard spheres and inverse square potentials. Predicting cross sections using dimensional analysis. Orbits resulting from other force laws. General relativity as a perturbation. Rotating frames and fictitious forces. Centrifugal and Coriolis forces. Central force problems re-expressed as one-dimensional problems. The three-body system, the Lagrange points and Trojan asteroids. Rigid bodies, especially the gyroscope. Precession of gyroscope subjected to a torque. Examples: the earth; the earth-moon system; NMR; levitron. Free precession of a rigid body will be mentioned briefly. Euler's equations and tennis racquet theorem if time permits. Different ways of driving a playground swing. The relationship between a periodically driven dynamical system and static equilibrium points of masses and springs in a periodic potential. Matrices. `Everything is a spring'. Successive approximation and perturbation expansions. Lagrangian and Hamiltonian dynamics introduced, gently. Normal modes are put first, rotating frames and rotating bodies later. Coverage of elasticity is reduced. No cantilevers. Coverage of rigid bodies is reduced. Only qualitative treatment of free precession. Possibly no Euler equations. A small number of handouts are distributed in lectures. Those, and my scanned lecture notes, are below. Lecture 1: The Energy Method. Lecture 6: Perturbation expansions + Lagrangian Dynamics, continued. Lecture 7: Pendulums, Lagrangian Dynamics, and the Hamiltonian. Lecture 10: Normal Modes II . Lecture 11: Normal Modes III . Lecture 15: Fictitious forces in rotating frames . Problem sheet (postscript) | pdf. For corrections to the handout, please go to Any questions? (last updated Jun 2001). The old 2000, 1999 1998 Problem sheets (postscript, gzipped). If you would like to find more fun Physics problems, please check out the Physics fun link. Would you like some more fun problems? I think you will find the following internet sites very helpful, and fun, for thinking deeply about Physics. `Physics question of the week' from UMD usually has easier problems, all of which relate to real physics demonstrations; each question and answer are accompanied by pictures or movies showing the experiment being done. You may find my page of comments on these questions is a helpful way to get into them, because I've included an index and marked my favourite questions. Probably the best way of all to learn Physics is to teach it to someone else. You may therefore find it helpful to dig around among the other Physics teaching resources on the net. Aristarchus of Samos proposed the Heliocentric theory. Hipparchus of Rhodes measured the angular height of the star Alpha Virginis above the ecliptic and compared it with 150-yr-old Babylonian observations. From the change of 2 degrees, he deduced that the Earth's axis precesses at 47 arc-seconds per year. He also made detailed observations of the moon and estimated the earth-moon distance with similar accuracy. Ptolemy knocks heliocentricity on the head because it violates Aristotle's ideas. 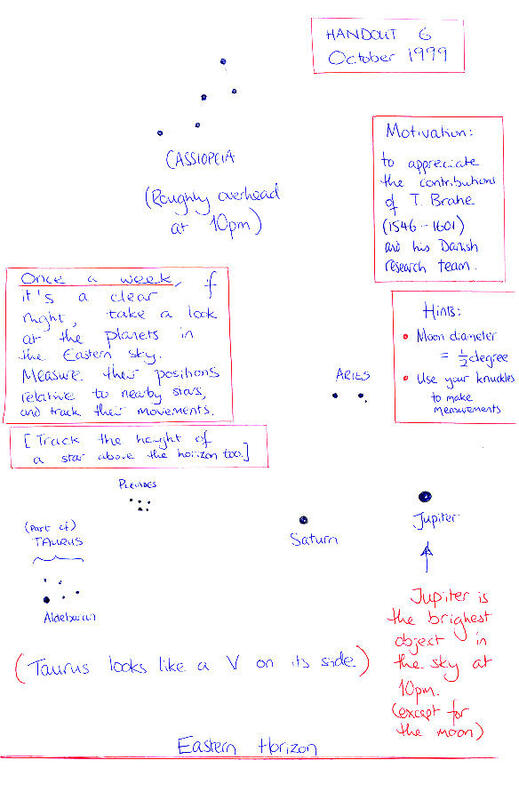 Building on Hipparchus's work, he wrote a detailed mathematical theory of the motions of the Sun, Moon, and planets. The earth's axis is tipped over through 23 degrees relative to the plane of the earth's orbit round the sun (called the ecliptic), and the orientation of the axis relative to the stars remains virtually constant (by conservation of angular momentum) as the earth goes round the sun. The equinoxes (roughly March 21 and September 21) are the two times in the year when the earth is `sideways on' to the sun, so that day length and night length are equal. The sun and the moon exert torques on the bulge, so the angular momentum changes. As the earth's axis slowly precesses, the time in the orbit at which the equinox occurs also moves slowly round the sun. Hence the precession of the earth's axis is called the precession of the equinoxes. The zodiacal signs correspond to 12 constellations, equally spaced along the ecliptic. The sun does the rounds of the constellations once per year. When the constellations were named and identified with times of year, Aries was the constellation aligned with the spring equinox (vernal equinox). Since that time (3000 years ago? ), the equinoxes have precessed through a substantial angle, so now the spring equinox occurs when the sun is aligned with a different constellation -- not Aries, but Pisces. However, birth signs are still allocated using the mapping of dates to constellations that applied 3000 years ago. Since the equator is perpendicular to the earth's axis, another way of saying where the equinoxes are, is that the equinoxes are the intersections of the equator and the ecliptic. The fact that the earth precesses was known to the ancient Greeks (get name and date), who had sufficiently accurate historical data on the timing of the equinoxes that they could detect the one degree per 72 years precession. Heavens Above - the best site for predicting satellites, space stations, comets, etc. Go to Greenwich and see them still working! Also, read the wonderful book `The Quest for Longitude' Harvard College Press, from which these copyright pictures are lovingly copied. In 1762, at the end of a 147-day sea voyage, H4 (below) had lost only 1 minute and 55 seconds. Remember the last one pound note? Isaac Newton is on the back, and an artist has rendered a planetary diagram next to him. What's wrong with this picture? Answer: They've put the sun at the centre of the ellipse! N.E.A.R. trip to Eros. 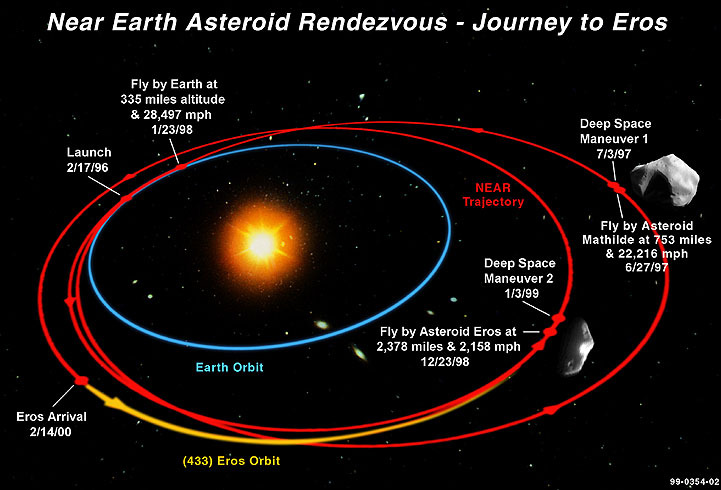 Eros is one of the largest near-Earth asteroids, with a mass thousands of times greater than similar asteroids. "NEAR" arrived at Eros in 1999 via a slingshot past Earth, but failed to brake hard enough on arrival, so didn't get into an orbit around Eros until its second attempt, on Feb 14 2000. Since then NEAR has been in an occasionally-adjusted orbit about Eros, with the last close approach to Eros taking place on Oct 26 2000. In December 2000 the Cassini spacecraft, on its journey to Saturn, will make its close approach to the giant planet Jupiter. Cassini's Venus-Venus-Earth-Jupiter Gravity Assisted journey to Saturn includes an approach within 6 million miles of Jupiter on December 30th. Cassini's speed, relative to the Sun, will increase by 2.2 km/s. Excerpt from the above pages: Starting out from a low Earth orbit, a spacecraft needs to increase its speed by 9 kilometers per second (19,440 mph) in order to reach Jupiter. Navigators refer to a needed speed change as "delta V," where "delta" indicates "change" and "V" stands for velocity. Keep in mind, though, that Jupiter's orbit about the Sun doesn't lie in the same plane as the Earth's, so a spacecraft going to Jupiter would have to move out of the plane of the ecliptic. This is known as a "broken-plane" maneuver. Couldn't the spacecraft go "directly" to Jupiter without having to make the broken-plane maneuver? Yes, but that usually means that the spacecraft needs to be going even faster to begin with - around 11 km/sec. By comparison, Galileo's Venus-Earth-Earth Gravity Assist (VEEGA) trajectory required that the spacecraft provide a delta-V of only 4.094 km/s to reach Jupiter. Of this total, 4 km/s was provided by the IUS booster; the other .094 km/s of delta-V came from Galileo's thrusters (the spacecraft also produced an additional 100 meters/sec of delta-V that was used to for science purposes on the way to Jupiter, e.g. for asteroid flybys). The additional delta-V needed to get to Jupiter was provided by the planetary flybys (2.0 km/sec (4,320 mph) from Venus, 5.2 km/sec (11,600 mph) from the first Earth flyby, 3.7 km/ sec (7,992 mph) from the second Earth flyby). Note that this doesn't add up to 9 km/sec total delta-V; that's because we're actually giving changes in velocity (which involves direction), not just speed, and velocity changes add as vectors. As a bonus, Galileo didn't have to perform a broken-plane maneuver - that was thrown in "for free" by the flybys. The Voyager spacecraft were an amazing feat of engineering, science and management; they sent back more information about the solar system than any mission before or since. This graph shows the boosts received in the slingshots of Voyager2 (from JPL's Basics of Space Flight). Voyager 2 leaves Earth at about 36 km/s relative to the sun. Climbing out, it loses much of the initial velocity the launch vehicle provided. Nearing Jupiter, its speed is increased by the planet's gravity, and the spacecraft's velocity exceeds solar system escape velocity. Voyager departs Jupiter with more sun-relative velocity than it had on arrival. The same is seen at Saturn and Uranus. The Neptune flyby design put Voyager close by Neptune's moon Triton rather than attain more speed. (From JPL's Basics of Space Flight). Consider a system with two large bodies, e.g. Jupiter orbiting the sun. The third body, such as a spacecraft or an asteroid, might occupy any of five Lagrange points: In line with the two large bodies are the L1, L2 and L3 points. The leading apex of the triangle is L4; the trailing apex is L5. These last two are also called Trojan points. All five points are fixed points in the rotating frame. L1, L2 and L3 are unstable fixed points, but you can stay near them with little effort. L4 and L5 may be stable fixed points, depending on the mass ratio of the two big bodies. Theory: for an ideal lossless ball in a vertical cylindrical pipe, the ball executes a vertical motion that is exactly sinusoidal. List of typographical errors in the course textbook, Analytical Dynamics by Hand and Finch (C.U.P.). On page 9, eq 1.33, 1.37 and 1.38 all have the space between alpha and q too small, so it looks like 1.38 for example refers to sin^2 ( alpha q ). In all these equations, the argument of `sin' or `cos' is just alpha [as you can guess on dimensional grounds]. p.376 "energy stored in pendulum 2" should be "energy transferred (temporarily) to pendulum 2". p.375 "must be either odd or even" -> "can be chosen to be ...."
p.373 "omega^2 = 0" - should say "this MAY correspond to a translation or rotation". p.364 Emphasize that the single linear transformation is not in general orthogonal. p.328 Figure 8.22 is confusing since the cylinder looks symmetric. p.417 "extra solar" -> "extra-solar". p. 142: "centrifugal force, which is repulsive, increasing as...." SHOULD BE "decreasing as......."
My software demos are written in gnuplot, octave and matlab. I will put the source code here. (b) ask an engineer friend to let you use theirs [all engineers use it]. Contains: doublependulum, orbits, modes, lagrangian, rigidbody. 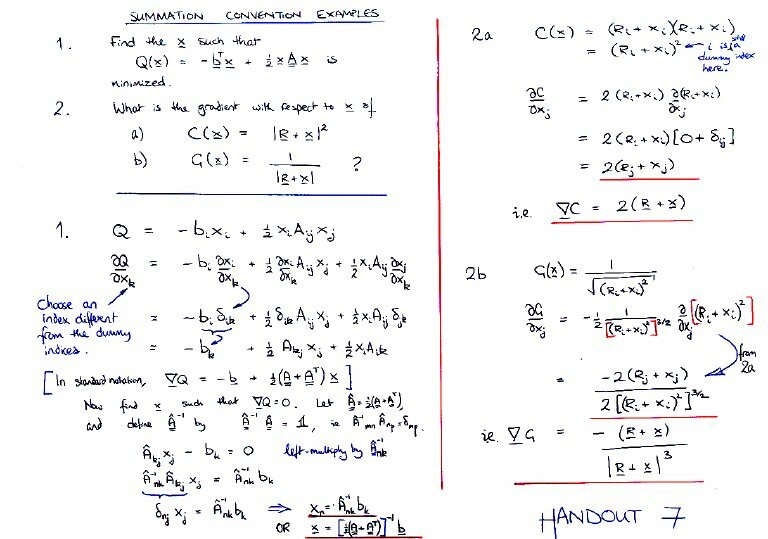 Lecture 4: Perturbation Expansions . A small number of handouts were distributed in lectures. My scanned lecture notes are available below. Lecture 1. | Course synopsis. | Handout 2 (Reading recommendations and rough lecture plan). We carried out a survey on 14th March 2000, to try to assess the effectiveness of our physics teaching. The results of this survey are posted here. Many thanks to those who participated!